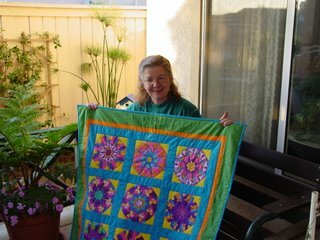 Joy Denise's Blog: Quilter's Garden is open! Yay! "There's a new store opening right across from Esther's Taco House and I think it's a quilt shop!" I think our initial strategy, if I remember correctly, was for her to start leaving notes taped on the glass. "Are you a quilt shop?" "If so, when will you open?" Anyway, fast forward a week or two. I got another call. "IT'S GOT TO BE A QUILT SHOP - I see shelves for fabric!" We decided that if we resorted to the note-leaving technique, the notes should read "Will work for fat quarters" and include our phone numbers. She was able to get away from work long enough to go the first day! She called me with a full report about "beautiful fabric, so cute, patterns, lots and lots of fabric, and a long arm, etc." Quilter's Garden......2007 E. Orangethorpe Avenue, Placentia, CA! In the NW portion of the Orangethorpe/Lakeview intersection. 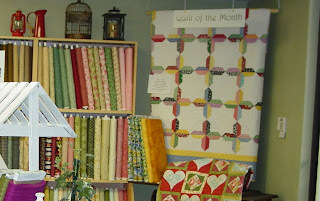 When I entered, I was invited to join their mailing list and also enter a drawing for the beautiful quilt below, by Diane Beauchamp (whose name is on the shop business card - she may be pictured in here somewhere - excuse my manners, I was a tad distracted by the fabric). This is Dolores Morris.....whose name is also on the business card. A very delightful lady, quite patient with drooling customers. From there, it just got better and better. Beautiful selection of fabrics, lots and lots of fabrics, great patterns! Yeah. Oh my, hello Beautiful Thing! Dolores might have heard me hyperventilating, but at any rate, she came over and introduced herself and told us a little bit about The Plan. The Plan is still being, well, planned! As I recall, it will include two options: one being that they will offer long arm quilting service and finish your quilts for you for a fee......or.......that the Beautiful Thing will be available for rent. And since it will take me a long time to get really proficient, I was interested in the fact that they are going to have a computerized system on it (maybe the StatlerStitcher?). Dolores told us it will do all the calculations for you when you key in the dimensions of your quilt, and will automatically perfectly execute the pattern you pick. Somewhere around this point, I may have lost my customary poise and decorum. I recall looking at Karen and Karene and just standing there with my mouth open, or grinning. Or both! Moving on, Dolores showed us the classroom. All those quilts hanging on the wall? Those are classes, my friends. Karen already has plans for that heart quilt. She sees that one in black prints, white prints and hot pink/deep red prints.....oh yeah! I like the one to the left of it, partially hidden by the popcorn maker - a pretty purple floral with winding ribbons that appear to cross or weave.....sigh! That is Quilt 101 class. You learn everything needed to make that, in the class (which I think is six sessions). That is a fantastic newbie quilt! There are several kinds of applique and lots of very useful basics and techniques covered in that quilt, and everything I have heard about the teacher, Regina Collett, has been very complimentary. I neglected to take a picture of one very important part of the shop. I completely forgot about it. I blame the sensory overload from exposure to all the fabric and ideas and quiltiness in one place. That's a normal reaction for me! Anyway, it's sew important, and sew cute, that I will go back and take a picture and post it later this week. Well, back to work for me. Gotta make some money so I can go shopping! Ah....the excitement of a new quilt store !!! I'm in SEW much trouble. I have decided to start daily exercise by walking to the Quilter's Garden and back again....for a total of two miles round trip. Of course that does not include all the "weight" I will be carrying on the way home, ha,ha,ha !!! It's an adorable store and I hope the word spreads quickly on it ! We are certainly doing our part. Sew many patterns, not enough time ! I better start getting more weekend jobs because this shop looks like it may be getting some business from me. Hmmmmmm, Wanna meet me there this weekend. LOL! I'll meet you there any time!!! Hey, if you get the OC Register, they got a great write-up in the Local section, page 4! but first I must purchase a bike rack/saddle bags, so I too can come home heavier than I start out!! Hmmmm, I will let you know when I am going. I am hoping to get a day in at the dock this weekend. Yeah! more money to shop with.